We know St.Metr.Philaret disagreed with the decision of those who began praying for Fr.Dimitri. His letters state so. It is amazing that ROCOR, under St.Metr.Philaret, was administered so well, considering, according to Fr.Alexander, St.Metr.Philaret didn't do anything. Many from other jurisdictions, who were despondent over the road their bishops were taking them, were joining ROCOR in crowds. And now many are unhappy and left ROCOR or are sitting on the fence. Somebody must have been doing something right, must have been HTM who administered ROCOR. Fr.John Shaw writes that HTM wrote the anathema of 1983, letters of St.Metr.Philaret were written by HTM. I must admit, they were very well written. Fr. John writes everyone follows Fr.Panteleimon. Well, if that is the case, Fr.Panteleimon and HTM did a very good job administering ROCOR. Because those were the golden years when HTM was with us. ROCOR was prospering spiritually and her faithful were happy. When we started proclaiming the MP is the Mother Church, the MP began thinking of glorifying Metr.Serge as their Sviatitel'. ROCOR will also have Patr. Serge as her saint. We will not have St. Philaret's icon, but will have icons of Metr.Sergei in our Churches. We will have no choice. This is our future when we unite with MP. Some fish, as did the Apostles, to relax and pray, some drink. Now that Fr. Alexander has finished bashing Holy Metropolitan Philaret, maybe NOW he can send us the Ukaze that directed the ROCOR parishes to pray for Fr.Dimitri Dudko. Furthermore, Holy Metropolitan Philaret could not have written such a strong letter of reprimand to the priest of ROCOR who prayed for Fr.Dimitri if there was such an Ukaze to justify prayers, of all things, at the proskomedia. .The priest could have defended himself before the Metropolitan, if he had such an Ukaze, but the priest had no defense. Furthermore, this Ukaze doesn't exist for NO policy can be administered in a diocese of a bishop without its bishop's approval! The bishop is the (hoziaen) lord of his diocese. Again, with grief, we read another attempt to discredit a pillar of Orthodox Confession, the Holy Metropolitan Philaret. Those of us who knew him as early as in China know that he wasn't afraid of anything, he only feared God. There was an attempt on his life in China by the Soviets who tried to kill him by burning the monastic dwelling in which he lived because he was so outspoken against MP and against Communism. But, this didn't stop him for he would not compromise the Faith. He simply refused to commemorate the hierarchy of MP or pray for the Soviet Government. As any head of a Church, Holy Metropolitan Philaret had faithful supporters that he trusted and it was Blessed Metropolitan Anastassy who told him to keep Fr.Gregory Grabbe as secretary of the ROCOR, which he did to help him lead the Church on the correct path. The Holy apostles were fisherman is there anything wrong for a bishop to fish? discredit Holy Metropolitan Philaret who stood with firm resolve against MP for it was founded on falsehood by Joseph Stalin in 1943 as you yourself, Fr.Alexander, have declared before. ROCOR cannot pray for Fr.Dimitri Dudko and be faithful to her "Bishops' Sobor, which resolved to be guided by and to fulfill the Will and Testament of Blessed Metropolitan Anastasy which stated that we must NOT have any communion whatsoever with the MP, not only in prayer, but also not even in ordinary contact of daily life." (quote from a letter of Holy Metropolitan Philaret). The Ukaze that Dimitra found certainly was sent from Synod. Holy Metr. Philaret did not sign it as he was in Australia at the time when this Ukaze was written. And Holy Metr. Philaret was very much against it. So, bishops waited til Holy Metr. was visiting Australia and quickly passed this Ukaze. That's why in his personal letters Holy Metr. Philaret was thinking of retiring. Fr. John can ask for a copy of the letters written by Holy Metr. Philaret from the Synod's archives. I am sure they will be more than happy to accommodate their own priest. Fr. John can ask Fr. Victor Patapov for a copy of the letter that Holy Metr. Philaret wrote him personally. I am sure Fr. Victor won't mind sending him a copy. Excerpt from Holy Metr.Philaret's Letter written when he was in Australia to a priest concerning Fr. Dimitry Dudko and MP church. For a long time now I have been intending to write a few words to you, but somehow I haven't managed to get around to it. But at last I have collected myself, and so I write. When I, while still in Australia, began to receive information from America already post factum that here [in New York City] there had been protests, demonstrations, and even molebens in front of the Soviet consulate, I became quite alarmed and regretted that I was not here, since I would have decisively opposed much of what took place. In particular, holding a moleben in such a place. Did they not sing the Lord's song in a strange land? What cause was there to display the holy things of the Church's services before the gaze of the frenzied servants of Antichrist? Was it really not possible to pray in church? In precisely the same manner, in receiving the Soviet clergy, we apply the principle of economia. And we receive the clergymen from Moscow not as ones possessing grace, but as ones receiving it by the very act of union. But to recognize the church of the evil-doers as the bearer and repository of grace, that we cannot do, of course. For outside of Orthodoxy there is no grace; and the Soviet church has deprived itself of grace. communion, but not even ordinary contact. On what basis then have you and other clergymen had direct relations with Father Dudko? And have written him letters, etc.? No matter how sincere a man you may have considered him to be, nevertheless, can your private opinion annul a ruling adopted by the Church? much. By the way, on what basis did you, even before this, take into your head to commemorate an archbishop of the Soviet church during the Great Entrance? Who gave you the right to do that, which hierarch who, how, where, when?.. Be more careful, my dear, zealous, but, ah, too impetuous fellow minister! Peace to you and the mercy of the Lord. To Matushka and the children too. "But a schism nonetheless occurred. The minority, accepting the declaration, formed a central administration, the so-called "Moscow Patriarchate,"
How many bishops compromise the Synod? There were no signatures on this Ukaze. We know Holy Metr.Philaret, who was first hierarch and who's diocese was Eastern America, did not sign the Ukaze or agreed with the Ukaze. Dimitra should be upset at Holy Metr.Philaret , not HTM, because they followed Holy Metr.Philaret's wishes who was head of their diocese. The Ukaze might have been distributed by the Synod, but it was not signed nor binding. If it was, B.Anthony of San Francisco would not have proclaimed one for his diocese. Eastern America was the diocese of our first hierarch, Holy Metr.Philaret, who did not agree with the Ukaze. B.Anthony of Los Angeles, Fr.Alexander's bishop, also did not agree and did not sign it. We can pray for whomever we want, but the Church cannot pray for those who are outside Her fold. The Gospel reading for the coming Sunday (Meat-fare Sunday_ reminds us especially of compassion for those in prison. "I was in prison, and ye visited Me," the Lord says to the merciful; and to the unmerciful: "I was sick and in prison, and ye did not visit Me." In our Homeland now there has appeared a new wave of persecutions. The Synod of Bishops calls on everyone to pray for those imprisoned. Therefore, on Meat-fare Sunday, Jan. 28/Feb. 10, I call on you in all churches after the Liturgy to serve a moleben for those in prison. We will commemorate: Priest Dimitry (Dudko), Priest Gleb (Yakunin), Priest Basil, Igor (Ogurtsov), Alexander (Ogorodnikov), Vladimir…and all, everyone who is imprisoned and suffers with them. The Chairman of the committee for the Defense of Persecuted Orthodox Christians, Priest Victor Potapov, has organized aid for the needy Matushkas of Fr. Dimitry Dudko and Fr. Gleb Yakunin. For this purpose I give my blessing for a special collection to be made in churches on Meat-fare Sunday. Russian Orthodox Church Outside of Russia"
those who refused to commemorate them? about him and remained cold towards him. Who knows if his fate would have been better, had we prayed for him then? Fr. Alexander Lebedeff wrote: Michael Nikitin is here, once again, demonstrating his complete ignorance of the way in which the Church Abroad is administered, how Synod Meetings are held, and how Ukases are distributed. Seal of the Synod of Bishops. Orthodox read the Holy Fathers for interpretations of the Bible and Canons. Each Protestant interprets individually. How one can call another's writings a heresy when no example of a refutation from our Holy fathers are given. We cannot be like Protestants. Basil quoted the Holy Fathers and was not refuted. His lengthy extracts were done for a purpose, which is to cover the whole thought not just a paragraph that can be interpreted many different ways. "I am accused of excessive strictness and of "fanaticism". But I have sufficient basis for holding to my point of view, for behind me stand great authorities, both ancient and contemporary." Basil had these authorities behind him. Fr's .John and Alexander do not. The Holy Fathers are the voice of the Church. They did not contradict each other on issues of Faith. Fr.John should give us an example where our Holy Fathers wrote that an anathema has to be in someones name? The anathema of 1983 which our ROCOR Synod pronounced is not in anyones name. The quote from Holy Metr.Philaret is found in the letter to Abbess Magdalena(Countess Grabbe) in Russian. If anyone wishes to read it they can ask Lesna Convent in France to send them a copy.I'm sure they would not mind giving Fr.John a copy if he asked for it. 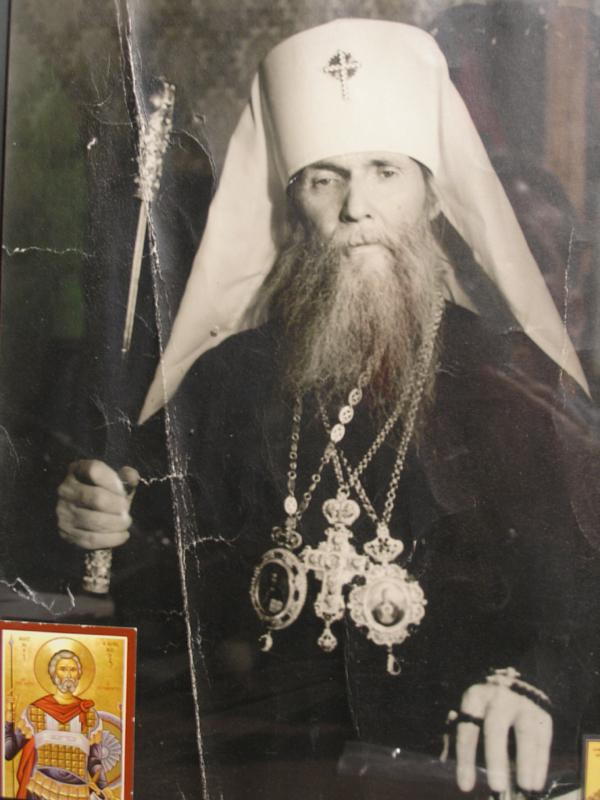 "A Letter from Metropolitan Philaret (Voznesensky) to Abbess Magdalena (Countess Grabbe), Superior of the Lesna Convent in France November 26 / December 9, 1979"
Holy Metr.Philaret also used the writings of our Holy Fathers to come to his conclusion that the MP was without Grace, because of this he will never become a Saint in ROCOR(L). His letters were never disputed as being incorrect, nor will they ever be ,because as he said, "behind me stand great authorities, both ancient and contemporary." Fr.John is not implying that Holy Metr. Philaret misused these writings to justify himself? If the writings of our Holy Fathers have never been refuted we can use them as being authoritative. Holy Metr.Philaret did just that. Basil also. Supposed hearsay from someone who is dead cannot be used as any authority, especially if they come from someone who attended a Church regularly, but can't remember if it had any doors. Writings from letters and cassettes can, especially if they are backed up by the writings of the Holy fathers. and listen to his speeches that are in agreement with what he wrote. Those who don't agree with his letters will try to discredit the tapes as they try their letters. Holy Metr.Philaret also used the writings of the Holy Fathers to come to his conclusion that the MP was without Grace.